I bought a Nitendo 64 system and I have a 55' Vizio Smart Tv. I tried to connect the Red and White cord to my tv there are two reds you can try on the back with the white green and blue option and one red and white for Audio on the side of the tv. I did not have any luck. I went to Target and bought a RF Video Converter Box. You screw the black code to the antenna part on the back of the tv. On the RF box you put in the Red White and Yellow cord. I tried Comp with the three dots as an option on my tv and I tried Antenna. I searched for channels but I can not get 3 or 4. I tried to add the 3&4 channel still no luck can someone help me please. Coincidentally, I also have a 55" Vizio TV and a Nintendo 64, my favorite console of them all, in my room. For whatever reason, I was able to get my GameCube to work with the TV, but I never could get the N64 to. I just tried it again, and went through every setting I could find on the TV, but still nothing. There's no picture, but I can hear music for not even a second before it goes silent. My Nintendo 64 definitely works, as I was playing Super Smash Bros. on it just a couple of hours ago with a different TV. and the input is set to "Composite". If it still doesn't work, then it's your TV. You can either return it and get another brand, get another TV for your game consoles (like I have), or mod (or pay someone to mod) your N64 to output in HDMI (however, this still isn't guaranteed to fix the problem). Another solution would be, if the TV doesnt want to take it, to buy a converter between the AV and HDMI format. If your TV doesnt take it by itself, you propably need something to convert the N64 signal to something readable. If you have a model for the TV I could look for the manual for it. My suggestions would be to make sure that the 64 works on another TV first. 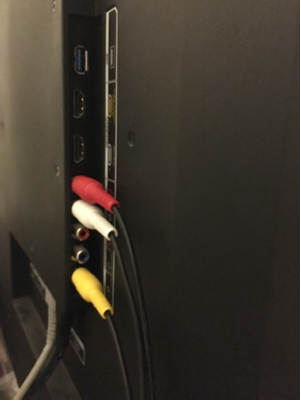 You should be able to connect your composite cables directly to the TV (Red, White, Yellow), and note that yellow is the cable that carries video. 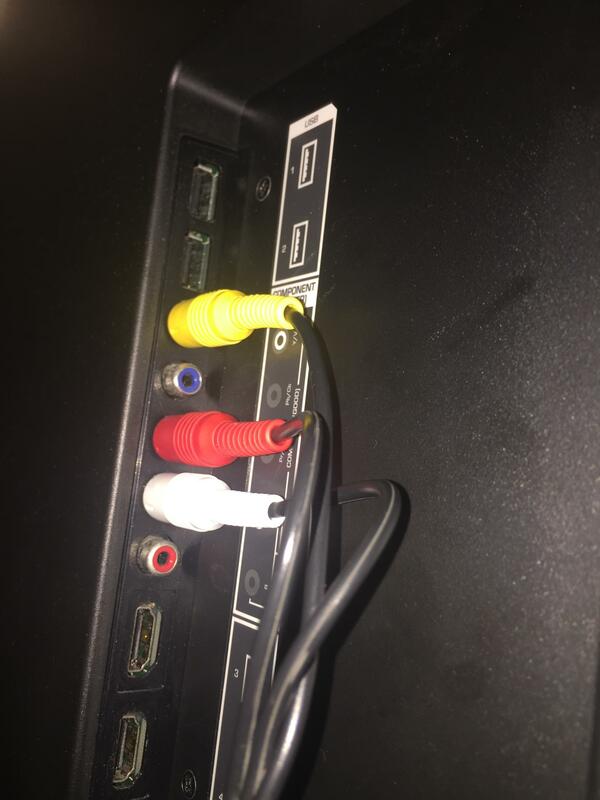 You can actually connect any composite (Red, White, and Yellow) cabled device to component (Green, Blue, and Orange video with Red and White audio) ports simply by plugging the yellow video cable into the green component jack, as RedEagle shows in their picture. Just switch to the input, which will be called Component by default or possibly switch to Composite if the TV recognizes the difference, and you should be good to go. Just make sure that nothing is plugged into the blue and orange jacks, as the TV will try to get a signal from those as well and the picture will be messed up as a result. Put video source to "Comp/AV"
Not the answer you're looking for? Browse other questions tagged nintendo-64 or ask your own question. How do I connect my US Nintendo 64 to a monitor? Can all EUR Nintendo 64 cartridges be set to English? Did I just fry my Nintendo 64? Nintendo 64 game will not boot! Can you play American games on a French Nintendo 64? How can I play old console games on a modern TV?